A British inventor has submitted a patent application for a wacky touchscreen keyboard design which, he claims, could spell the end for accidental key presses. David Baker’s Crocodile Keyboard is so named because its keys are shaped like the reptile’s sharp teeth. 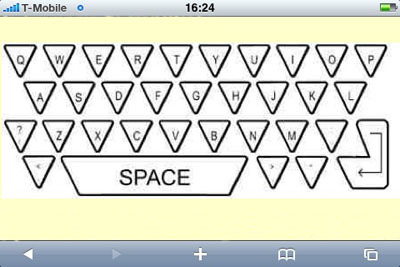 Baker told Register Hardware today that each triangular key has significantly more dead space around it than you’d find on a standard Qwerty layout. Consequently, users are more likely to press the correct key each time they tap. Although originally designed as a physical keyboard for the Palm Pilot – the project was speared due to manufacturing costs, says Baker — the inventor is adamant that a virtual Crocodile Keyboard could be successfully ported onto the iPhone. Apple's publicly available iPhone OS software development kit makes this possible. However, Baker believes that the virtual keyboard’s full potential will only be realised if it’s integrated into every area of the iPhone that uses a keyboard, such as SMS and email, rather than developed as a standalone application. For this to happen, he requires Apple’s aid, something he described as "very difficult to get".